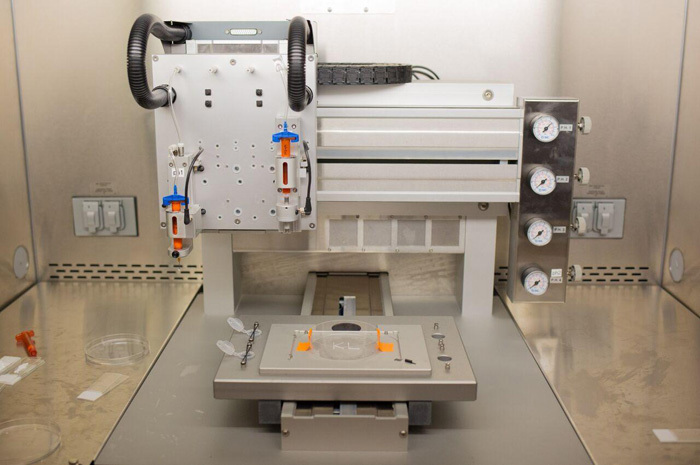 Recently, the 2 bioprinters using sells instead of ink have arrived from Switzerland to the University of Virginia. They stay in the edge of medical technology and will eventually print tissues for treating patients with burns, diabetes and even organ failure. Tissue printing is no news to the medical society. There already exist printers able to create a tissue from homogeneous sells. But the output (from tissues to organs) wasn’t functional. These printers have the resolution much finer than other medical printers and can print a few cells next to each other and then move over to another location and print some more cells making everything more precise. The small enough capillaries and other vessels are responsible for a blood flow (which will make an organ “alive”). These printers have the technical capability to print them to allow proper blood flow, but it may take a few years of the researches to be done. The scientists look forward to creating for example clusters of cells in pancreas responsible for producing insulin to treat people with diabetes or even to get a new pancreas. A tissue or an organ won’t be rejected because they are done from the patient’s sells. But the technology still needs to be improved. In the meantime, the printers are used in the university researches and help students grow. This entry was posted on Tuesday, June 9th, 2015 at 11:31 am	and is filed under 3D, printing, technology.